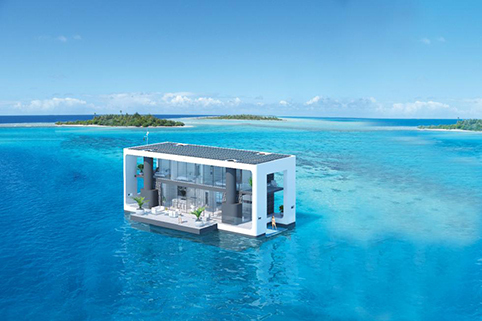 You are here: Home / Feature Article / Rising Seas and Bigger Hurricanes … No Problem with a Floating House! 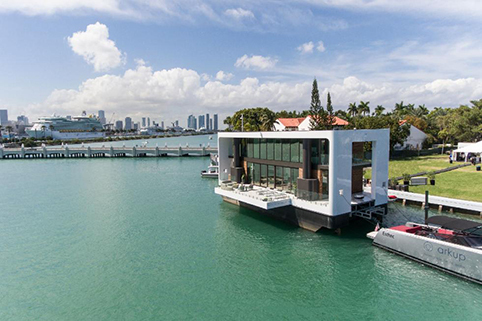 While man grapples with the fear of the unknown such as stronger hurricanes and rising seas that they worry will eventually turn inland cities such as Orlando and Philadelphia into beachfront property, a Florida company has found a solution for the very wealthy: the houseboat of the future. 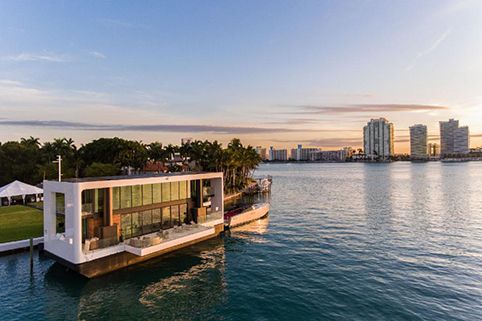 Equipped to run on shore power or the sun, Arkup’s “first electrical livable yacht” combines a luxury yacht, waterfront villa and self-sustainability into a glamorous floating-motoring home. Able to run completely off grid via 2,300 square feet of rooftop solar panels, the boat has four spuds that can lift it above the water on its automated hydraulic pilings. 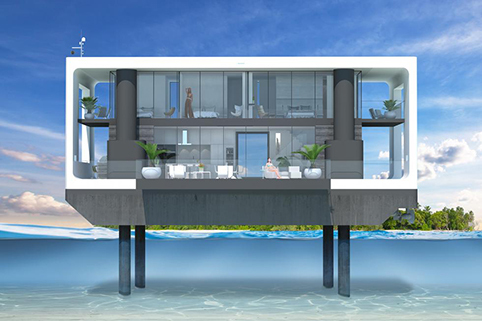 It can withstand a Category Four hurricane and provide a grand lifestyle off the grid almost anywhere there is water. With no yard work or property taxes. Measuring 75 feet in length with a 32-foot beam, the Arkup has 4,350 square feet of indoor and outdoor living space divided between the main and upper decks. It can cruise to new locations, tie up at a dock or hydraulically rise and stand above the water. 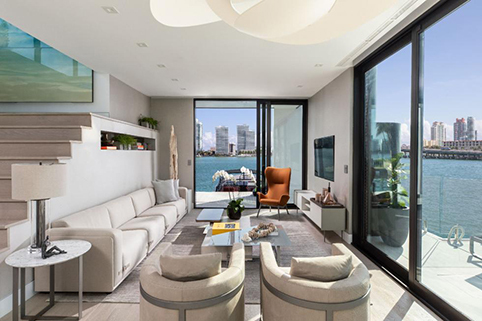 Cutting-edge contemporary design with open floor plan and floor-to-ceiling glass walls bring in unobstructed ocean, bay, lake or river views and extend out to five terraces with glass railings. The main deck contains the main living area and fully equipped Miele kitchen. There is also a two-berth crew cabin that can be used as an office, a bathroom, laundry room with washer and dryer, trash room with compactor, outdoor kitchen and helm station. The upper deck has four ensuite, king-size bedrooms. The master suite has a walk-in closet, balcony and free-standing Jacuzzi. Whether one’s intent is to contribute to a light footprint on the planet or to assuage fear of getting their foundation wet from the melting ice cap, Arkup offers several options. Charter before making the decision to buy at $6,000 a night for eight guests or purchase starting at $5.5 million up to $12 million. 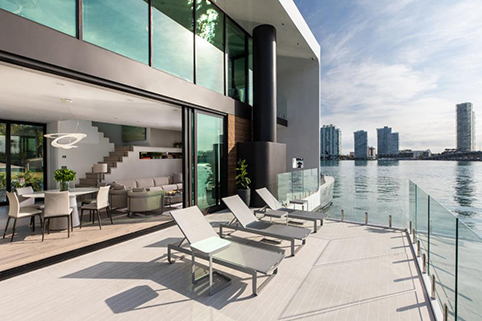 The existing floating villa on offer is priced at $5.9 million completely furnished and decorated. Arkup is co-brokered by Marius Koller of MK Miami Real Estate and Antonio Maldonado, Advantaged Yacht Charters, both located in Miami. Add Instant Style with Container Gardens | Healthy Aging® Baby Boomers Say No to Downsizing Where’s America Moving? 8 Housing Options for Seniors Who Don’t Want to Live Alone Have You Seen the Latest Issue of Healthy Aging® Magazine?